The battle to control Maoism has reached the Tihar jail’s barracks. Exasperated prison authorities are thinking of changing Maoist ideologue Khobad Ghandy’s ward after every two months because he has been propagating ultra-Left ideology among fellow inmates. Ghandy, 63, has built a captive audience inside Jail No. 3 at Tihar, his home for the past 11 months. He meets fellow inmates, who revere him, every day during his morning and evening walks and often holds “interactive sessions”. He tells them he had fought for the poor throughout his life and that the government had failed to do anything for the people. The prisoners salute him after every session. “He is a very good man. He is fighting for the poor and we respect him a lot,” said a 35-year-old inmate of Jail No. 3, a Class X dropout who is facing trial for attempted murder. Ghandy, a CPI (Maoist) politburo member, was arrested in September 2009 and booked under the Unlawful Activities (Prevention) Act. 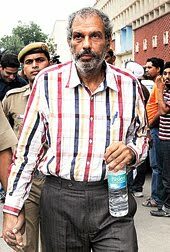 Ghandy’s rising popularity among fellow prisoners is worrying Tihar authorities. A jail official said around 1,500 prisoners — 100 convicts and 1,400 undertrials — were lodged in the 12 wards in Jail No. 3. Ghandy shares his ward with many other prisoners. The official, however, agreed that Ghandy, who is from an upper class background and went to the best educational institutions, was a thorough gentleman. “He is very enthusiastic and agile for his age. During the basketball match, he was joking with jail officials about many things,” said jail superintendent Vijay Kumar Sharma. Ghandy had studied at Doon School and St Xavier’s College, Mumbai, before travelling to London to become a chartered accountant. A few years later, he joined the Maoists. He is now believed to be writing a book on his life.